This study aims to interpret Liszt's Transcendental Study No. 11, called Harmonies du Soir through the Soleil Couchant literary theme and its aesthetic implications in French Romantic poetry. The vision of the Romantic Soleil Couchant resonates in various French Romantic poems, particularly Baudelaire's Harmonie du Soir. The principal contextual aspects of this literary topos form the basis for our discussion of the musical experience of a virtuoso Étude. Our musical analysis will therefore explore the music both in terms of the musical content and its performance aspects. We will try to read the music as an audio-visual phenomenon which creates an emotional artistic aura, similar to that of the contemporary Soleil Couchant. The discourse of Baudelaire's poem and Liszt’s Étude as obvious as it may look, is not to be taken for granted, since there is no evidence that Liszt had ever read Baudelaire's Harmonie du Soir (published 1857) before giving a similar title to his work (1851). Neither is there any evidence that Baudelaire was personally acquainted with Liszt or with the Étude. But, assuming that there is a dominant Zeitgeist regarding the representation of the sunset theme, the absence of a proven interaction between Liszt and Baudelaire is irrelevant. Moreover, the concept of a virtuoso performance as an outstanding spectacle – a prevalent Nineteenth Century idea which will be discussed further on – was part of that Zeitgeist. It is well-known that the Romantic Movement recruited natural phenomena to the aesthetics of the self-focused yearning to the unattainable and converted them into a vehicle for sentimental inconsistency and to the transformation of the sensation into a vision. A cause-and-effect relation between nature and overflowing powerful feelings was gradually established as an immanent part of the Romantic tradition, where nature turned into an expressive, mediating artistic language. Many distinguished scholars, such as Abbate, Dahlhaus, Goehr, Kramer, Meyer, Monelle, Rosen and others have discussed the presence of an extra-musical topic as a motivating metaphor for musical expression. This study aims to apply the aesthetics of a well-known extra-musical topic on a single piece of music. The philosophic aspect of the meaning of music is far beyond the scope of it. Till now, Liszt's Étude has not been examined through a literary topos in the sense defined by Ranter (Ranter) or in any other sense. Likewise, and surprisingly, scholarly discussions of the Études did not view the poetic titles either as an analytic springboard or as a contextual evaluation tool. Neither was the histrionic dimension of the musical experience undergone by performer and audience thoroughly appreciated (Monelle). Being a central theme in French Romantic Movement, the Soleil Couchant, which was prominent from Hugo to Baudelaire, emerged out of a unique poetic experience which was rooted in the Romantic idea that nature was a vehicle for self-consciousness, even a substitute for religion. The visual aspects of sunset, such as the chromatic spectrum of colors and ever-changing combinations of light and shadow motivated a rich collection of metaphors that were easily recognizable in French poetry from as early as 1817 (Lamartine, L'Isolement). Baudelaire's Harmonie du Soir was, in a sense, the Symbolistic culmination of the aesthetic phenomenon. For Baudelaire, the evening harmonies symbolize an unrepeatable, spiritual metamorphosis, which he introduces with prophetic biblical language ("Voici venir les temps…", Baudelaire, p. 121). The spiritual union of the human being with exalted emotions such as love, beauty and perfection in their visionary concept, are suitable to match a mystic epiphany. The movements and contrasts of the emotional landscapes and the energy they produce constitute the metaphoric effect of Harmonie du Soir. The harmony evoked offers relief and exaltation in response to the obsessive Coincidentia Oppositorum through a metaphysic resolution of dissonances, similar to a musical cadence. In this sense, Harmonie resembles the traditional musical meaning and linguistic use of the word. The highly intoxicating mood of Baudelaire's poem is locked within the fixed Pantoum form (Harvey & Heseltine, p. 423), where repetitions in a different context intensify the poem’s trance-like power. A perfect Pantoum, however, consists of a series of quatrains, where the second and fourth lines of each stanza are repeated by the first and the third lines of the next. The final stanza usually differs from this scheme, and its final line is the poem's first verse, and its second is the poem's third. Baudelaire modified the pattern, and used two new lines in the last stanza for its second and last lines. That way, instead of overlapping end with beginning, he used the formal framework to intensify emotional tension towards the end or the conclusion of the poem. Thus, the poetic narrative accumulates linear dramatic energy together with its circular agitation. This formal thought resembles musical forms made of recontextualized repetitions impressively culminate in some kind of a musical "punch line" (coda) such as Variations, Rondo and even Sonata Form. Historically speaking, the thematic framework which gradually shaped the Soleil Couchant emerged from the main poetic works that were written over a period of nearly forty years, beginning with Lamartine's Méditations Poétiques (L'Isolement -Solitude 1817, Lagarde & Michard, pp. 94-5). Lamartine extended the Soleil Couchant theme to the year cycle (L'Automne 1819), depicting autumn as the annual sunset, as a time of sweet death and of the "adieux" melodic season. In Moïse (Moses, 1822), Alfred de Vigny offers a lavish description of the sun as it sets over desert sands, leaving golden traces in the air"(Lagarde & Michard, p. 125). Another poem by de Vigny (Les Destinées: La Maison du Berger, Shepherd's house, 1840-44) fuses the aesthetics of nature's golden splendor with ritual mystery and tranquility. Vigny’s use of the words encensoirs and reposoirs create a spiritual aura of sights and feelings, Balance les beaux lis comme des encensoirs", Lagarde & Michard, p. 138), while the same words will re-appear in Baudelaire's Harmonie du Soir. We believe this is the first time that Baudelaire's allusion to Vigny in his descriptive terminology has been noted. The theme of Soleil Couchant figures extensively in the poetry of Victor Hugo. The main works to be noted in this respect are Les Feuilles d'Automne (1831), Les Chants du Crépuscule (1835), Les Rayons et les Ombres (1840), all of which make ample use of rich, poetic vocabulary. In 1847, following the tragic boat accident in which his daughter and son-in-law drowned after their wedding, Hugo wrote the poem Demain, dès L'aube…where he describes sunset as a joyful event which he must abstain from when mourning at his daughter's tomb (Lagarde & Michard, p. 178). Baudelaire was obviously inspired by the golden lights and mists of his predecessors, as well as by the Romantic perception of visual trivia, both expressed in quite a few of his poems. The fact that Liszt's title Harmonies du Soir appeared six years before Baudelaire published Harmonie du Soir, is of no surprise, since the concept was, as mentioned, a Zeitgeist. Liszt first wrote the Douze Études d'Exécution Transcendante in 1827 under the title Étude en Douze Exercices. He subsequently re-wrote these works twice: in 1837 as Douze Grandes Études and in 1851 in their final version under the title Études d'Exécution Transcendante, adding the adjective "transcendante" as well as poetic titles (Samson, pp. 8-9). Commenting on the sonnet, Correspondances, which Baudelaire included in his essay on Wagner, Joseph Acquisto recently claimed that Baudelaire not only rewrote Wagner, but also rewrote Baudelaire, in order to express his own aesthetic ideas. He thus used music as a mirror to reflect his insights about poetry, memory and modern urban life. In the view of Acquisto, Baudelaire's essay on Tannhäuser symbolizes the perennial conflict for supremacy between music and poetry (Acquisto, p. 13). It is clear to us that, in his essay on Wagner, Baudelaire was expressing his own ideas and thoughts, creating a form of Baudelaire's Wagner, or Wagner's Baudelaire. It should also be stressed that the debate on the music-text relationship was an integral part of the musical discourse and aesthetics ever since the Council of Trent, and perhaps even before. Very important events in Western musical history were consequences of that supremacy conflict: the motet, Monteverdi's madrigals and Orfeo, as well as the symphonic poem, to mention but a few. For a brighter view of the conflict, let us look at Belgian poet Réné Ghil, who wrote Traité du Verbe in 1885. The concluding essay of his treatise suggests that the "stroke of inspiration" in modern poetry should be the timbre, the quality of sound as with musical instruments. Ghil considers that writing verse is a form of orchestration, with vowels and consonants, accents and pauses matching brass, woodwinds and strings (Bergeron, p. 53). The idea may sound bizarre, but if we take it a step further, it is possible for a pianist-composer, a genius such as Liszt to "orchestrate" a cultural-poetic theme using the palette of his instrument and his various performing abilities, thus "to make thought sing and to make song think" (Kaufman, pp. 197-8). The concept of thinking melodies or singing thoughts is pertinent to the examination of Liszt's affinity with the literary world of contemporary Paris as a successful virtuoso. The findings of this examination, together with a comprehensive musical analysis will enable us to read Étude Number 11, Harmonies du Soir, through the Soleil Couchant aesthetics, and particularly refer to the transformation of a visual experience to a climactic event. The adjunction of a contemplative, experimental, piano study and its gestural histrionic aspect with the emotional subtext of the sunset palette, transform the musical experience into a symbol of sublimity and magnetism. A musical piece, which fuses the technical-didactic piano study with mystery and magic, expresses the composer's enthusiasm for poetic perfection, inspired by ideas which were part of his artistic climate. The drama attached to the performance, hence the phenomenon of the virtuoso who, using his body solely gives life to the score and hypnotizes the audience, complements that perfection. Performing the impossible was (and is) an attraction, in fact the core of a public musical show, either in the Parisian Salon or in the concert hall. Initiating poetic energy which is derived by a visual experience, Liszt's Étude leads the musical performance to the realm of the theatrical stage. On this stage, a one-man-show is carried out, where the artist is the stage director, the actor (sometimes playing more than one character), the lighting operator and the orchestra. Thus, one must not wonder that Liszt actually invented the piano recital, a perfect arena for such a show. Liszt arrived in Paris when he was twelve years old (1823) and lived there for twelve more years – a significant part of his life in many respects. The aesthetic revolution of French Romanticism made a deep impact on him, while French became his "mother tongue" (even though he was raised in a German-speaking environment). Moreover, as Bartók suggested, Liszt's musical oeuvre is "the antithesis of the excessive density and laboriousness so characteristic of the works of the outstanding German composers of the Nineteenth Century: it is rather the clarity and transparence of French music that manifests itself in every measure of Liszt’s work.” (Bernstein, p. 187). During the years he spent in Paris, and whenever he visited the city, Liszt socialized with artists, men of letters and intellectuals who attended Paris’ Salon Soirées (Guichard, pp. 4-5). For many years, he was a close friend and admirer of Lamartine whose Harmonies Poétiques et Religieuses (1830) inspired Liszt's Les Préludes (1854), in which titles of Lamartine's poems, as well as quotations of lines, functioned as a literary preface to the music (Main, p. 133). At the beginning of his career in Paris, Liszt did not write musical compositions, and focused only on performing. But in the early 1830's, under the catalyzing influence of Paganini, Chopin and Berlioz, he began to elaborate the idea of composing music in which poetry and piano virtuosity would be fused in a new manner. As an experienced virtuoso who travelled all over Europe, he probably discovered the power of the musical show and its affinity with the power of poetic/linguistic virtuosity. It is therefore surprising that Baudelaire and Liszt did not know each other personally, nor engaged in any discussion or exchange of ideas, even though Wagner describes in his letters a brief encounter between the two over lunch (Bernstein, p. 191). It is, nonetheless, quite clear, from the Journaux Intimes and the Tannhäuser essay, that Baudelaire was familiar with Liszt's works (Baudelaire, p. 1227). And there is, of course, Le Thyrse (1864), the lyrical eulogy which Baudelaire dedicated to Liszt. The unique experience of the Soleil Couchant, with its varied harmonies accords with the image attributed to the Romantic virtuoso in mid-Nineteenth Century Paris. Chopin, Berlioz, Liszt and Paganini were principal figures of the city’s exciting soirées, where extraordinary musical performances took place. The term "transcendental" used by Liszt, in 1837-8, in reference to his first set of Paganini Études, and then applied to the Grandes Études in 1851, represents his affiliation with general Romantic ideas of his time regarding musical performance, as well as his awareness of the audience's expectations. Both involve a certain degree of occult, metaphysical aura. The evocative, vibrating terms used by Baudelaire in Harmonie du Soir could also be pertinent to an extraordinary, exalted virtuoso performance while for both the starting point is a sensual experience which is converted to exalted art. In his demonstration of instrumental mastery, the virtuoso not only wowed his audience, but also gained publicity and the admiration of the critics. By dominating every technical difficulty, he became a free spirit, a unique, triumphant artist who acquired sublimity. These accomplishments transformed the performing musician from a talented craftsman into a dramatic figure, who during a unique event could undergo, with his audience, a climactic emotional metamorphosis, out of a paper score and a wooden piano. Those emotional events, hidden in the score (therefore available to music readers only) and resurrected by the pianist (thus made available to all), looked arbitrary, but were carefully designed by the composer/pianist for a maximum effect. Being busy with them, and amazed by the master's virtuosity, the audience would not care whether the musical composition was coherent in the "German" sense (à la Bartok, see fn. 20), since the spectacular compensated for the systematic. In his comprehensive discussion of the Études d'Exécution Transcendante, (Samson, p. 102, 175, 279) Jim Samson (quite surprisingly) does not refer to the specific aesthetic aspects of composition and performance that pertain to their poetic titles. He only notes that those titles represent generalized moods, and must be considered as an integral part of the piece. Samson briefly refers to the bass pedal notes called Glocken, which feature at the opening bars of No.11 but which were discarded by Liszt when he decided on the title. Apparently, the process of choosing the titles was for Liszt a multi-level experience in which an extra-musical, overt or covert inspiration played a central role (Tanner, pp. 173-92). Our analysis actually suggests a fresh reading of Liszt's composition, through a methodology which takes into account the histrionic dimension of the performance. We shall now attempt to discuss Étude Number 11 using both conventional tools of analysis and parameters attached to the cultural Romantic context, the "sonic alchemy", a term we borrow from the magnificent description by pianist Franc Clidat (Clidat, p. 315). The opening sounds of the piece proclaim the fragmentary nature of its essence. The bass pedal on the dominant (m. 1 onward) implies the Db tonality which resolves in a weak cadence (m.9). The so-called "melody" in m. 2 also consists of an upper voice of successive chords that proceed in intervals of seconds and thirds, with neither beginning nor end, and which emerge full-fledged only in m. 38. It then becomes a "theme" as the open-ended, melodic fragment fuses with the "bell" element. But up to m. 24, neither the tonal center nor the melodic contours are clear. They actually serve the musical expression of the meditative mood implied by the very title of the piece, as well as by the gestural vocabulary required for the performance. M. 24 can be regarded as the "beginning" of the piece in terms of tonality and drive, since the cadence in m. 24 articulates the tonic key and starts the melodic development and spectacular piano virtuosity. Even if the mm. 1-23 section exemplifies a traditional Nineteenth Century introduction, exposing the elements from which the music will develop, it is still a display of the emotional subtext emerging from the idea of evening harmonies in terms of the sound spectrum of colors and range of the instrument. A distant bell rings quietly from the low piano register, with no distinct rhythm (long notes, arpeggios and fermatas). 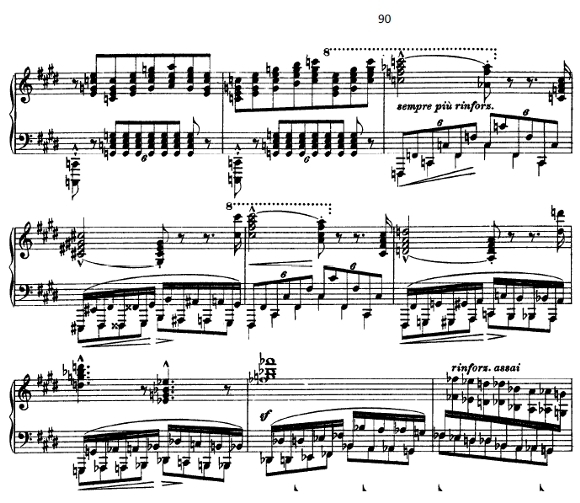 The music in the following bars has a dense texture as the pianist moves his hands over the entire keyboard, displaying an extraordinary gestural passage. The harmonic progressions in mm. 1-9 and mm. 10-23 are non-functional and purely decorative. These features are the essence of the kaleidoscopic composition of states-of-minds and gestures that develops throughout the entire piece. The Étude constantly articulates more sonic/emotional colors while unfolding and exploring experimental virtuosic combinations of the fragments presented in the opening. The music will change in every possible aspect, as is characteristic of Liszt's compositional techniques (which culminated in his symphonies and the B Minor Sonata). Thus, the wholeness of the piece is accomplished by its ever changing fragmental nature, which functions like a dramatic narrative of feelings. Some musical aspects indeed represent Mid-Nineteenth-Century aesthetics and techniques, such as the implication of tonality through the use of a pedal on the dominant, or the evocation of a "theme" in a remote tonality (G:) within a confusing key signature (E: see m. 38). The central relevant aspect to our study is that the music displays a spectrum of thematic manipulations, as well as piano sonorities, that express a personal palette of emotions and body language inspired and motivated by the compositional perception of Harmonies du Soir. These manipulations create a musical form of multi-participant discussion which is sustained by various repetitions and re-composition of existing material, recycling and magnification of different aspects. The compositional thought of the piece resembles the continued diversity, unrest, and cyclical tension-relief structure derived from sunset in Baudelaire's Pantoum. As to be expected, the last bars of the Étude (142-155) allude to the same palette used at the opening (mm. 1-9), but with more specific performance instructions: dolce, armonioso sempre arpeggio, tranquillo, l'arpeggio sempre piú largamente -all which point to gestural expressions such as hovering long arms slowly playing endless arpeggios. At the end, the bass pedal disappears, perhaps because the required Db and dreamy affect were already fully articulated in the last part of the work. The dense, multi-note chords are spread out across the whole range of the keyboard, in such a way that it is impossible to play them simultaneously. As a result, a "rain" of wide-ranged broken chords creates a richness of sound and requires an apparent change in the performer’s body language. While the pianist has to move successively from left to right on the keyboard at bars 1-9, he must now simultaneously move his hands from the two extremes of the keyboard to the center (m. 142-150) and conclude with the silent arpeggios of the final four bars, almost quoting bars 6-9. Here the musical kaleidoscope returns to its starting point, and the pianist can now rest on his laurels and enjoy his applauded magic. 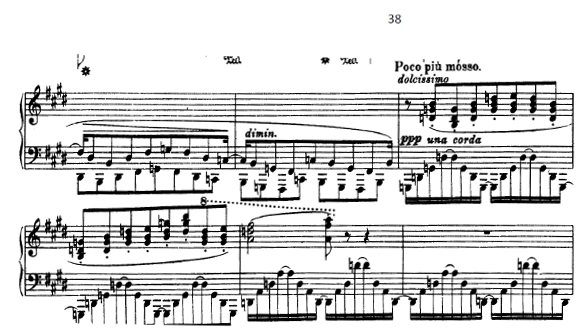 The meditative affect of both the opening and end of the Étude appears once again, in mm. 59-79, "piú lento con intimo sentiment" using a remote E major tonality. The new tonality is reinforced after a "virtual" performance in the key signature only, as early as m. 30. It is possible to consider this section as the dividing section of the piece. However, in our view, the radial aspect made up of repetitions is more relevant since it suggests a cyclical structure rather than a linear narrative of development. In the mid-section, from m. 59 to m. 79, Liszt provides us, for the first time, with a clear, contemplative, melodically-phrased structure, which is developed from the initial melodic fragment in m. 2. The nature of the melody and the "accompagnamento quasi arpa" instruction actually re-interpret the opening bars, and stress the additional difficulty of performance. The perceivable melody is of a musical relief to the audience, but the pianist has to "sing" the melodic contour using the right hand for long notes, while the accompanying chords are divided between the two hands over quite an expanded range. Since this has to be done very slowly and quietly, a delicate use of both piano pedals is required, combined with perfect finger control. The physical gestures that accompany the performance of this section create quite a visual choreography of pianism, combining restriction and stability of touch for the cantabile, with lightness in the floating arpeggios. The approaching fortissimo (m. 65 on) demands a gradual increase in force using the entire body. The same cyclical dimension seems to be at work in the treatment of the theme (Ex. No. 1, m.38 on) and its derivatives which feature in large parts of the Étude. The round nature of the melodic pattern, which begins from m. 2, is more evident from m. 10 on, when it begins to develop, climaxing at m. 38. Mastery of piano-playing is required for the performance of mm. 10 onward, when the pianist must adhere to the crossing hands dolce instruction. Nor is it easy to maintain the appropriate rhythmic stability while playing syncopated, seven-note chords (mm. 24 onward) while increasing the momentum towards a climax. The choreography now becomes acrobatics, actually magic. The technical difficulties are not meant to be noticed by anyone except the performer whose body language intimates the spiritual energy he must invest. The animato sections consist of the opposing fragments of the opening, i.e. the "bells" and the melody (Ex. No. 2, mm. 1-5). These two elements are, metaphorically speaking, the chips of the musical kaleidoscope mentioned. They fuse together for the first time in a dolcissimo version of the complete theme, which is introduced softly, almost in a whisper, in G major. The G major is not evident in the key signature, but an ambiguity used by the composer to tell us that dramatic events are to follow. As expected, the next round of the theme unfolds with a new layout of the musical content, a trionfando (m. 80 on). Liszt maintains the technique of the kaleidoscope and transforms the theme into a fresh realm of colors, just as he did with the quiet, intimate musical idea discussed above. The theme is now played fortissimo, reinforced by a full cadence (mm. 79-80). The performance requires lavish physical gestures here; these are essential to create the power for the fortissimo, the six-against-eight rhythmic pattern and the constant expansion of register. The musical agitation from m.95 up to m. 120 heralds the third introduction of the theme, which is articulated in the tonic key. The music consists of familiar musical material (mm. 95-119), and requires an extended tour-de-force by the pianist. Octaves running in chromatic progressions and divided between the two hands intensify, with a drumming effect in seven-note chords (m. 98). The drive towards the real triumph of the theme and the tonic key becomes almost insane in terms of technical difficulty in m.104, calming down and softening from m. 130 (dimin. Subito) to the conclusion of the piece. A master of transformations, Liszt used repetitions to explore the strength of the instrument and the pianist alike, while imparting a new emotion to every musical aspect. There is every reason to believe that Liszt was thinking about transforming central Romantic ideas into a musical performance when he renamed and revised the Étude, in accordance with the new technical achievements of the instrument which developed up to the Mid-Nineteenth Century. His compositional technique was, of course, not entirely unique to him: the genre itself requires certain extravaganza by its didactic nature. Certain Nineteenth Century character pieces such as Chopin's Études, Ballades, and Préludes, Schubert's Impromptus and Mendelssohn's Lieder Ohne Worte display the same compositional ideas. Nevertheless, the musical embodiment of the fusion of a Romantic vision of the Soleil Couchant to emotional-gestural music is unique in Liszt's Étude. Here, contemplative music clashes with technical obstacles and becomes a source of excitement, admiration and satisfaction for pianist and audience alike. "Mere music" has been metamorphosed into an astonishing experience generated by one person. In this sense, the virtuoso performance is a magnified version of music making, just like Baudelaire's poem is a magnified version of a visual event of nature. Certain analytical aspects of the term "harmony" need to be discussed. We have already pointed out that the central key, Db Major, is not immediately understood as such at the very beginning and that the first theme-like material is explicitly introduced in the remote G Major, within an E major framework. In fact, E Major is the key in which the central thematic events take place for the first time, when the theme introduced in m. 38 becomes trionfante (m. 80 on) and the complete melody appears (m.59 on). In other words – if one is impatient to define the key of the piece thematically – this key would seem to be E major (a very remote key regarding the tonic Db Major). But, the "drive" towards the tonic, which starts as early as m. 24 and appears again from m. 98 onward, contradicts this idea. The obstinate Ab-Db progression in the bass (m. 98 onward), firm cadences and the complete theme that glorifies the tonic key show that Liszt is still committed to the traditional tonal system. The intriguing harmonic events discussed above could function as Harmonies in the visual/emotional sense of the word and contribute to an instable and elusive musical structure. Apparently they represent a constantly changing palette of sonorities and could explain the use of the term "harmonies" in the plural for the title of the Étude. Indeed, Liszt uses other keys in a similar manner, as harmonic colors that change rapidly (Ex. No.3, mm. 88-95). As a result of the kaleidoscopic nature, harmonic ambiguity supports the cyclical concept, while the tonality of Db Major only becomes apparent later on. It is perceivable at the beginning of the piece (on and off, mm. 10-25) and becomes much more obvious at the end, but is not necessarily the basis of the structure. The harmonic characteristics are not to be separated from the general flow of the music. The neutralized cadences whose obscure shifts in tonality are the engine that makes the kaleidoscope go round, resting only at the middle section, towards the closure. Apart from these sections, the music goes round and round in a variety of keys, textures and body gestures which make up the experience of a piano spectacle that is a unique one-evening event, but which will be repeated the following evening on another stage. The musical essence continually emerges from the fragmental material of the beginning, and becomes "naked" again at the end. As Jim Samson pointed out with regard to the twelve Études, Liszt’s music is a composition of performance (Samson, p. 78). The ever-changing nature of Harmonies du Soir, in which each central musical idea is repeated three times, is harmonized with the kaleidoscopic nature of both the Romantic vision of sunset (and the shape of the sun itself as well as with the gipsy life of the traveling Nineteenth Century virtuoso). Liszt himself wrote that "each person silently takes pleasure in revelations and visions for there is no name and designation," even though "the master is still master of his work and may create it under the influence of certain impressions, of which he would like to make the Listener fully and completely conscious." (Cited in Hoeckner, p. 166). We based our discussion on the dual desire of the artist, a poet, composer and performer, to express and exhibit his expressive powers and, at the same time, inspire a reaction of wonder in his audience. Baudelaire and Liszt metaphorically meet at the juncture of this passionate desire and the Nineteenth-Century French aesthetics of transcendental execution. Reading and analyzing Liszt's Étude as a theatrical audio-visual performance suggest new appreciation of this music, which was considered of "low" quality for years, and is rarely performed up to our days. Strikingly, one must turn to the prestigious piano competitions all over the world to realize that Liszt's piano music was written for the stage rather than for the CDs.